Newport Beach, Calif. - Seven of last year's nine winners of major awards in the Newport Ocean Sailing Assocation's Newport to Ensenada International yacht Race will return to the starting line off Balboa Pier for the 63rd annual classic Friday at noon. Spectators won't have any trouble picking out the fastest one among the 212 entries: H.K. 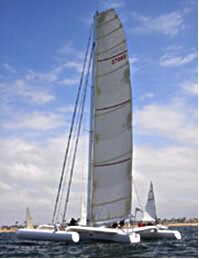 (Loe) Enloe's Jeanneau 60 trimaran, LoeReal. It's the tall one with three hulls. In 2009's dream reaching breeze, as Doug Baker's Magnitude 80 ripped off a record time by a monohull of 10 hours 37 minutes 50 seconds, Enloe, of El Paso, Tex., and his world-class crew sailed their French-built beauty to the second fastest time ever by a multihull of 8 hours 45 minutes 3 seconds. That earned them the race's NOSA award for fastest elapsed time by any boat. Mag 80 won't be back, but LoeReal, representing San Diego's Silver Gate Yacht Club, returns with an ambitious goal: the race multihull record of 6 hours 46 minutes 40 seconds set by the late Steve Fossett on the Stars & Stripes catamaran in 1998---the only boat ever to finish before sundown. Do they have a shot at it? "Well, right now I'm just worried about winning the race," Enloe said. "But a littler prayer might help." The overall winner on corrected handicap time---Maxis plus PHRF A through K are eligible---will receive a $6,000 Lamborghini diamond watch. OVERALL CORRECTED TIME (President of USA; all PHRF)---Sojourn (Catalina 30), Cleve Hardaker, San Diego, 14:01:44. CRUZ (Sec. of Foreign Relations, Mexico; corrected time all Cruz Div. boats)---Windswept, Karlin Scott, Newport Beach, Calif., 13:56:59. MAXI (President of Mexico; corrected time)---It's OK (Andrews 50), Tres Gordos Sailing, LLC, 15:56:26. FIRST ALL-FEMALE (Caroline Starr; corrected time)---Cruz Control (Santa Cruz 27), Annette Cook, Women's Ocean Racing Sailing Assn., 16:02:03. 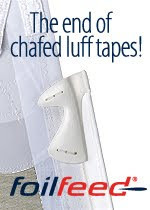 DOUBLEHANDED (Volvo; corrected time)---Carpe Domani (Catalina 27), Larry Wilson, Navy Yacht Club San Diego), 14:35:50. HIGHEST CORRECTED TIME (Brass Spittoon; all boats)---C.C. (Columbia 29.2), Chris Meyers, 20:46:24. The fastest-rated monohull is Lorenzo Berho's Kernan 70, Peligroso, handicapped at minus-123 seconds per mile. There are only four other boats in the Maxi class: Taxi Dancer, a Reichel/Pugh 68 from Santa Barbara YC, rated -84; Dennis Conner's Farr 60, Stars & Stripes, San Diego YC, -63; Tres Gordos LLC's It's OK, an Andrews 50 from Balboa YC, -57, and Alec Oberschmidt's Staghound, an R/P 50 from Southwestern YC, -51. The rest of the usual big boat crowd chose to sail to San Diego instead of Mexico this weekend. The forecast at midweek for Friday was for south-southwest wind of 8 knots, following a couple of days of rain showers. Rain doesn't matter; it's wind that counts. One of LoeReal's crew, John Gladstone of North Sails, also sailed with Fossett in '98. He compared that race to last year's on LoeReal. "The winds were quite similar to 1998 with Fossett on Stars and Stripes but not as much as expected," Gladstone told Scuttlebutt, the e-mail sailing newsletter. "We started with 9-10 knots and didn't see more than 13 the entire race. We pretty much hugged the coastline all the way to Pt. Loma until we reached the Coronados at about 5 p.m. At this point we had some confidence the wind would hold, so instead of hedging offshore as was originally planned we popped this new A3 that pushed us down nicely to a lay line close to Todos Santos [Bay]." The boats were not similar. Both were 60-footers, but Stars & Stripes---built to beat New Zealand's 130-foot monohull in '88---was a catamaran while LoeReal is a tri. S&S had a wing sail, LoeReal a standard rig. And S&S was much lighter.